Word 2016 lacks an AutoComplete function. It was removed a few versions ago. In its place you create an AutoText building block, which works just like the old AutoComplete. The AutoText building block is a typing assistant. You create building blocks for text you frequently type, such as your name, address, apologies, and so on. After you type the first few letters, Word pops up the AutoText building block bubble, as shown. Press the Enter key to have that text inserted automatically into your document. An AutoText building block in action. Type the text you want to stick into an AutoText building block. For example, your name, street name, business, or any text you regularly type. If you want the building block to include the Enter keystroke at the end of a line, ensure that it’s selected. If not, just select up to the last letter of the word you want in the building block. In the Text group, click the Quick Parts button. Choose AutoText → Save Selection to AutoText Gallery. The Create New Building Block dialog box appears. The options in the Create New Building Block dialog box are set pretty much the way you need. 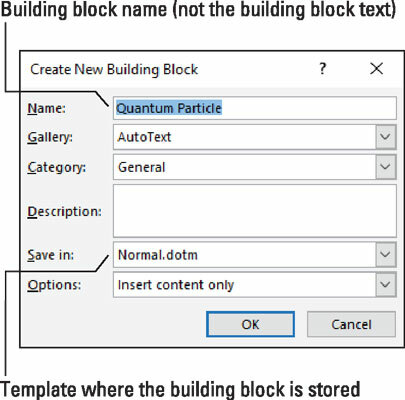 If you’re using a specific template, however, choose Normal.dotm so that the building block is available to all documents in Word. The selected text is added to the list of building blocks. The Create New Building Block dialog box. To try out your invention, start a new line of text in a document and type the first few letters or words that you set as an AutoText building block. When you see the bubble appear, press the Enter key to insert the text. A faster way to insert a building block is to type the first few letters and press the F3 key. That way, you don’t have to wait for the bubble to appear. For more precise text-selecting, disable Word’s word-selection feature. Instead, direct Word to select text one letter at a time. If you have trouble not selecting the Enter key when you select the building block (refer to Step 2), type some text after the last word in the building block. That extra text prevents Word from automatically selecting the Enter key (paragraph character) at the end of a paragraph. Use the Options menu in the Create New Building Block dialog box to set how Word inserts the text. Choose the option Insert Content in Its Own Paragraph to ensure that the building block is set as a line by itself. You can select multiple lines of text as a building block. For example, your return address. • Keep the building block names unique, as well as the starting text for a building block. For example, if you create two building blocks that start with the same text, neither ever appears when you type text.